Throwing away old electronics isn’t just bad for the environment, it’s also against the law. Electronic waste, also known as e-waste, is 100% recyclable. But, sadly, only about 15% to 20% of all e-waste is recycled. 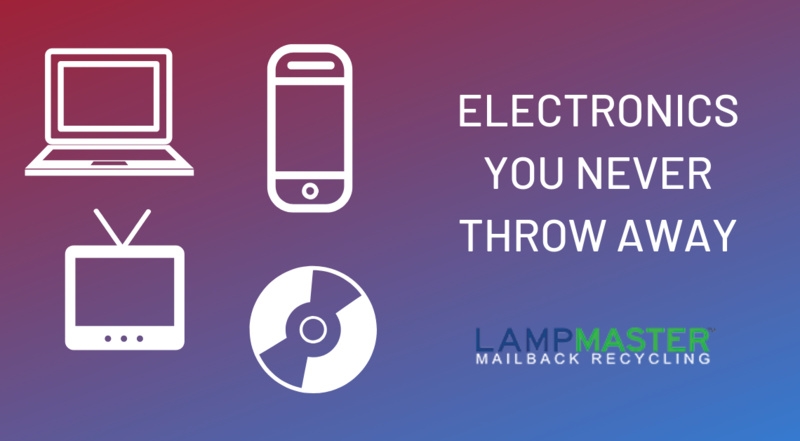 Chances are, you own some electronics you should never throw away in the trash. One of the biggest mistakes you can make for the environment and your own security is to throw away the wrong electronics. Here are five electronic items you should recycle instead. Television technology has advanced significantly in recent years. Very quickly, we have gone from watching cathode ray televisions (CRTs) to flat-screen plasma, LED, and 4k monitors. And with each new edition consumers buy, they are left with an old unit they must sell or get rid of. And therein lies the problem. Most people don’t know that it’s illegal to simply throw away a television set. Just the glass alone on an old square-box CRT television contains up to eight pounds of lead. The glass also holds other toxic metals including cadmium-based phosphorous. If the glass breaks, these toxic materials are released into the air or ground. There are still millions of these old-school televisions laying around peoples homes. Newer televisions have different technology, but similar environmental concerns. If you’ve got an old television set, sell it to someone who wants it or recycle it. Computers are another item which should never be sent to a landfill. Not only is it bad for the environment, but computers can also be reused to make new computers. Talk about a win/win situation. Many computer companies, such as Apple, are joining the circular economy. That is, they are attempting to replace the old model of manufacture, use, and disposal with a new process of reducing, re-using and recycling. So many items on a computer can be reused in the fabrication of new computers. For example, the plastic and glass can all be repurposed on a new computer. This practice helps us preserve our natural resources and be kind to the environment. Cell phones and tablets contain a number of precious precious metal, plastics and copper. By recycling or reusing these items, we conserve valuable resources and prevent pollution. What’s more, recycling cell phones and tables reduces greenhouse gas emissions emitted during the manufacturing process. Recycling your phone can have a significant impact on our resources. Recycling one million cell phones saves enough energy to provide electricity to 185 U.S. households for a year. Got an old printer you need to get rid of? As satisfying as it may be to go “Office Space” on it with a baseball bat, that’s probably not the most environmentally safe thing to do. It’s also not the most economically wise thing option. Staples, Office Depot, Dell and other vendors offer trade-in credits for your old printer. If you’re in the market for a new printer, that will save you a few bucks. If you don’t need a new printer, recycling your old one is the smartest option here. As we transition to MP3 listing and streaming media, we are ending up with a lot of old DVDs and CDs we no longer need. Unfortunately, there is a limited recycling market for the type of plastics which make up these discs. Your best option may be to give away your media to a local secondhand store or music reseller. Or give your CDs and DVDs to a reputable recycler who knows how to properly dispose of them. It doesn’t require a lot of effort to throw away your electronics responsibly. In many cases, you can drop your materials off into a waste container at a recycling facility. You’ll feel good knowing you are in compliance with the law and being environmentally-friendly. If you need to get rid of some old electronics, check out our recycling services here.